The City of Tacoma is giving away free reusable bags while supplies last to help shoppers with the Bring Your Own Bag ordinance. Bags are given out primarily through social service organizations including food banks, Tacoma Housing Authority, community centers, Tacoma Rescue Mission, and Tacoma Public Libraries. View a complete list of organizations partnering to distribute free reusable bags to Tacoma area shoppers. 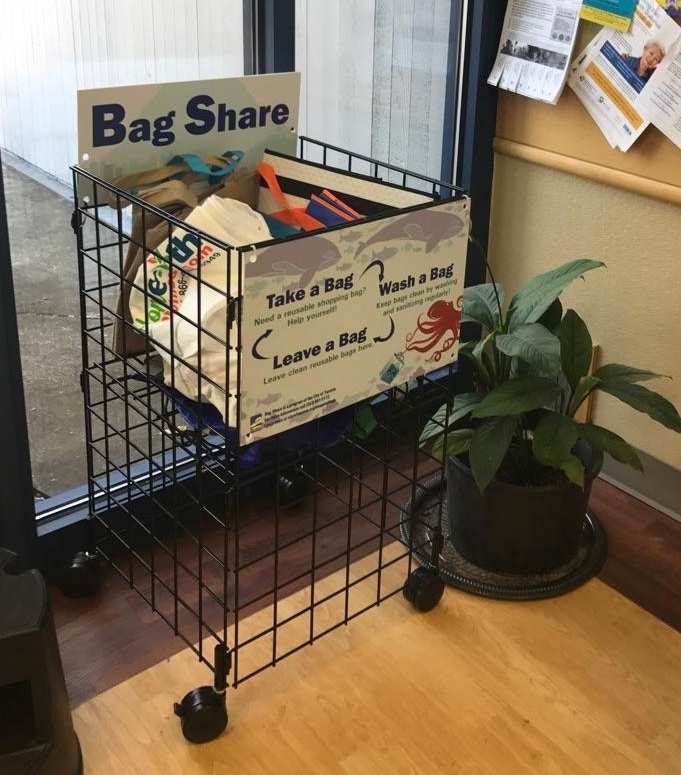 Reusable bags are also available for pickup from the TacomaFIRST 311 Customer Support Center located on the second floor of the Tacoma Municipal Building (747 Market Street). The Bag Share program seeks to increase access to reusable bags in Tacoma. Do you have extra bags that you never use? Or are you heading out shopping, but don't have a bag? Stop by a Bag Share location and either leave a clean reusable bag or pick one up when you are in need. Keep reusable bags by your door or in your vehicle. Try keeping your bags in the front of the car where you can see them. Place a "grab the bags" sticky note on your dash or car door handle. Small foldable bags can go in your purse, briefcase, or backpack, or can be attached to your key chain. Make "bring shopping bags" the first item on your grocery list. To keep reusable bags clean, the Tacoma-Pierce County Health Department recommends that you wrap raw meat in plastic and throw away the plastic bag, keep reusable bags dry when not in use, wash cloth bags once a week in hot water with detergent and dry in the dryer, and clean plastic lined reusable bags with hot water and soap and allow to air dry before storing. View or download the Shopper Frequently Asked Questions. What is the Bring Your Own Bag (BYOB) law? The BYOB law is a ban on thin plastic checkout bags (less than 2.25 mils) and a fee on recycled paper and other retailer provided checkout bags. The law is meant to reduce waste and littering and encourages shoppers to bring their own bag rather than buying a new bag each time they shop. BYOB was passed to address the problems associated with disposable checkout bags. Each year an estimated 70 – 100 million disposable plastic checkout bags are used in Tacoma. These bags contribute to the waste stream, create unsightly litter, and threaten marine life. Disposable paper bags also have significant life cycle impacts by consuming energy and releasing greenhouse gas emissions. Choosing to “bring your own bag” helps improve the health of our community and our environment. What bags are still available? Retailers may distribute paper checkout bags made of at least 40% recycled content. Retailers may also distribute other qualified checkout bags that are designed for long-term multiple reuse. Any checkout bag provided to the customer will be charged a minimum pass-through fee of five cents. Other non-checkout bags are still available such as produce bags used to package meat and bulk items inside the store before purchasing, dry-cleaning bags, and tire bags. Will I be charged if I bring my own bag to reuse? No, you can bring any type of bag (reusable, paper or plastic) with you when you shop and you will not be charged to use it. Where does the pass-through fee go? The pass-through fee is kept by the retailer to offset the cost of providing recycled content paper or reusable bags which are usually more expensive than disposable plastic bags. How are low-income shoppers impacted? All residents are encouraged to bring their own reusable bag when shopping, but people with EBT, WIC or TANF benefits do not have to pay the pass-through fee when they receive a paper checkout bag. These exempt customers must show proof of EBT/WIC/TANF benefits at the time of checkout. Enforcement is mainly complaint based. Compliance complaints are being facilitated through TacomaFIRST 311. Residents can call 3-1-1 within Tacoma city limits or (253) 591-5000. Or visit the Online Resources webpage linked on cityoftacoma.org/TacomaFIRST311, then click Make a Request, click Miscellaneous Solid Waste Request or Complaints from the list, fill out the form and choose BYOB Complaint from the dropdown. The complaint will go to Solid Waste and a staff member will do educational visits/outreach to the store and work with them to get into compliance. All retail stores in the city of Tacoma are affected by the law. This includes grocery stores, convenience stores, department stores, hardware stores, liquor stores, pharmacies, and all others including temporary retailers and vendors such as at farmers markets and festivals. Can disposable plastic bags be used for takeout food? Restaurants, grocery stores and others that sell takeout food can provide disposable plastic bags for prepared take-out foods and liquids intended for consumption away from the premises. This is to safeguard public health and safety during transportation of take-out foods. What kind of reusable bag is best? Many Life Cycle Analysis studies have found that lightweight reusable bags made from recycled plastics (polypropylene) are the most environmentally friendly choice. Bags made from cotton canvas are resource intensive but may be extremely long-lived. There are also some lightweight bags, some of which may be of recycled content, which will not be long-lived. As with any utilitarian item, material, cost and quality will make a huge difference, depending on how it is used. That said, the best kind of reusable bag for you is the one you actually reuse! I reuse my plastic checkout bags for other things (trash bin liners, lunch, pet waste, etc.). What do I do now that these are banned? In other cities with similar laws, residents generally find substitutes. Try packing lunch in a reusable bag, go without a bin liner for your small trash bins, and look for pet waste specific bags in grocery stores or in city parks. You may also use empty plastic bags from the newspaper, bread, cereal and other packaged items. What are other ways to reduce disposable checkout bags? Communities are using a variety of methods to reduce disposable checkout bags. Unfortunately, education alone is the least effective methods of getting people to switch to reusable bags. Common methods today range from banning plastic bags, to banning plastic bags with a fee on paper bags (5–25 cents), to putting a fee on both plastic and paper bags (5–10 cents). Eleven other Washington communities have chosen the same model as Tacoma, commonly called the “Bellingham Model”, while four other Washington communities have chosen to just ban plastic bags.